Poston Mill Park01981 550225work01981 550000fax Holiday & Touring ParkPoston Mill Park, in Herefordshire’s Golden Valley, offers fully serviced and serviced hard standing pitches for caravans, motor homes and camping. The 35 acre Poston Mill Park gives you the ideal base to escape, relax, and enjoy yourself. Explore Herefordshire and the beautiful Welsh Borders, either on foot, cycling, by car or on a bus. There is a bus stop at the park entrance. There are plenty of places to visit during your stay: local villages, the cathedral city of Hereford, Hay on Wye (the town of books) and slightly further afield, Ross on Wye, the Black Mountains or Brecon, nestling in the foothills of the Beacons. 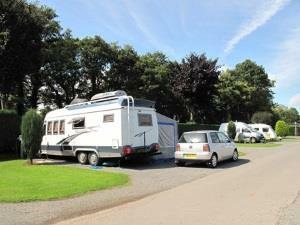 Our award-winning park welcomes all the family including your pets. We have a three mile dog trail and a dog field for them to run free, and when they get dirty, a dog wash and dry area. Our recreation field has, petangue, grass tennis, croquet and sits alongside our 9 hole pitch & putt field which is part of our David Bellamy conservation project, and of course there is brown trout fishing on the River Dore. The Mill restaurant and Poston Shop sit in Poston Courtyard please see our website for opening times or ask at reception. Poston Mill Park, in Herefordshire’s Golden Valley, offers fully serviced and serviced hard standing pitches for caravans, motor homes and camping. From M50 J4, take the A49 towards Hereford. After approximately 7 miles turn left onto the B4348. Poston Mill is about one mile before Peterchurch. Further directions available through our website.